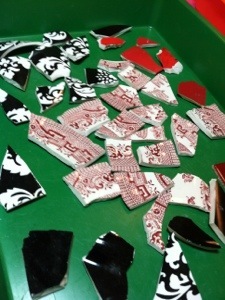 Mom has a friend who teaches a mosaic tile class and we signed up to go on Saturday. 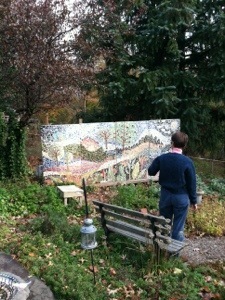 The class was at her house and much of her house is covered with tile. She made the above panels to hide her compost pile. The hardest part was deciding what colors to use. I have always liked the red transfer ware dishes so I picked those as my first color. Then all the other pieces just seemed to go with those. Assembling the frame around the mirror became a giant puzzle and after several hours I was happy with the design. Everyone in the class quietly (and intently) worked on their designs. And, everyone’s was completely different. 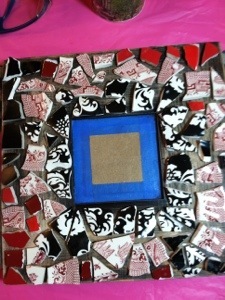 I have to wait 48 hours before I can grout it all but so far my pieces have remained glued on. Now I just have to figure out where to hang it. Kerry was happy when I returned home. He had attempted to bag up leaves with Miss H ‘helping.’ Our yard looks so much better and we even have grass now. (When we moved in we were both a little concerned about the state of the yard). Today, Miss H had a friend come over and they tried to destroy all the remaining leaf piles plus got the bikes, balls, puzzles and Lincoln Logs all out. Both of them were exhausted post-lunch time.